Hanford was a small agricultural community in Benton County, Washington, United States. 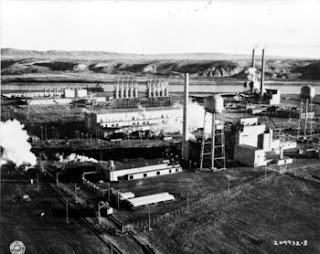 In 1943, the town was evacuated, along with the town of White Bluffs, in order to make room for the nuclear production facility known as the Hanford Site. The Hanford Site was one of the first and biggest nuclear production centers during World War II. It was home to the first full-scale plutonium production reactor in the world. During the Cold War, the Hanford Site was expanded to include nine nuclear reactors and five massive plutonium processing complexes. These devices produced plutonium for most of the 60,000 nuclear weapons in the U.S. arsenal. Waste disposal practices were inadequate during early nuclear testing and production in the United States. In the 1980s, the U.S. government released documents confirming that Hanford’s operations released significant amounts of radioactive materials into the air and the Columbia River. This contamination has threatened the health of residents and the ecosystem. The weapons production reactors at the Hanford Site were decommissioned at the end of the Cold War, but the manufacturing process has left behind 53 million gallons (204,000 m³) of high-level radioactive waste. The waste remains at the site and it represents two-thirds of all high-level radioactive waste in the U.S. The Hanford Site is the most contaminated nuclear storage facility in the nation. It is also the focus of the United States largest environmental cleanup. The Hanford Site occupies 586 square miles (1,518 km2) and the Columbia River flows along the site for approximately 50 miles. The site is bordered on the southeast by the Tri-Cities, a metropolitan area composed of Richland, Kennewick, and Pasco, which is home to over 230,000 residents. This area of Washington becomes warm in the summer and extra firefighters are stationed in the surrounding communities in case of toxic brush fires. More than 70,000 containers of this waste (sometimes referred to as suspect TRU waste) were stored under a layer of dirt in the in the 1970’s and 1980’s, in the 200 Area Low-Level Burial Grounds of the Hanford Site.